Muito bom cara! Estou voltando a mexer com o display de oled 128×64 e o seu código vai me ajudar bastante, estou tentando fazer fontes grandes (25×48) pra fazer uma espécie de display de relógio (e.g., “12:45”). Valeu! 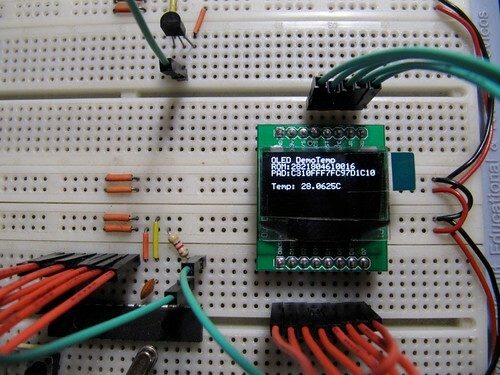 hey ..nice work..any ideas of having the code been used for SPI interface for the display. Yes, I’m working on a version 2 of code, with SPI option. Stay plugged this weekend for download it. 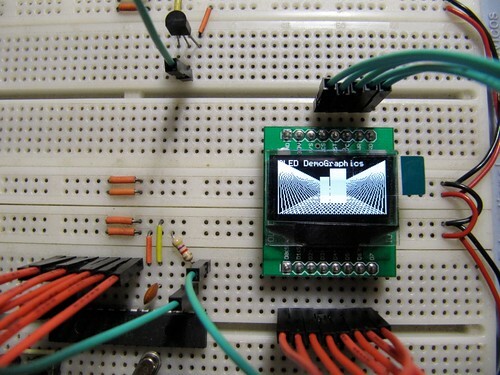 Wow – where do you get a nice oled like that. would you share the schematics of the breakout pcb ? I’ll fix it and inform you. Thank you for your interest. i try this code with pic18F2550,but with under frequency “4Mhz” ,so i changed the delays to be confortable for my CPU clock…..but it doesn’t work….please help me!!!! Did you know if your display controller is really the SH1101A? Some of this displays have the same aspect, but the majority of them uses diferent controllers. The most common don’t are teh SH1101A, because its dont support I2C, and its a nice feature today. thank you forrequi.je resoulue the problem of frequency, but when testing with PIC18F2550. the DS18B20 only gives the résolution.il not work to the point that it works correctly with isis …. please help me with what I am preparing my end of study project on it! !